On August 14, 2018, the Morandi bridge in Genoa suddenly collapsed during a rainstorm, sending vehicles and rubble plunging 150 feet into the river below and resulting in 43 fatalities. The Morandi bridge had been in operation since 1967 and its failure reignited concern about the condition of bridges and other infrastructure in Europe, the US, and elsewhere. The US, for example, has almost 600,000 bridges, most built after 1945. With an expected life span of around 70 years, many bridges are reaching end-of life: in fact, the American Road and Transportation Builders Association rates 56,000 bridges, with over 185 million daily crossings, as “structurally deficient”. Structural engineers rely on tools such as structural health monitoring (SHM) to monitor bridge conditions. SHM is a method to analyze the condition of a bridge, building, or other structure, and implement a program to detect changes in time to avoid potential disasters. The process begins with an initial characterization of the bridge’s dynamic response to build a reference data set; this forms a baseline for subsequent comparative analysis. The characterization uses the techniques of structural dynamics to capture the main modal parameters such as the natural frequencies, the mode shapes, and the damping ratios. Gathering real-world data is required to calibrate the theoretical model of modal performance; the model may have been developed from the primary design equations, or retrospectively via a 3-D finite element analysis (FEM) model. An electro-mechanical shaker can be used to excite a small structure with forced vibration and measure the data directly, an approach known as Experimental Modal Analysis (EMA), but this method is less feasible with large structures such as bridges. Instead, an Operational Modal Analysis (OMA) collects vibration data caused by traffic once the bridge is in service and uses it to calibrate the theoretical model. Evaluating the vibrational behaviour of bridges is a relatively recent practice, and in most cases there is no experimental data available. Very few older bridges have theoretical design models, and even fewer have vibration data from dynamic testing. 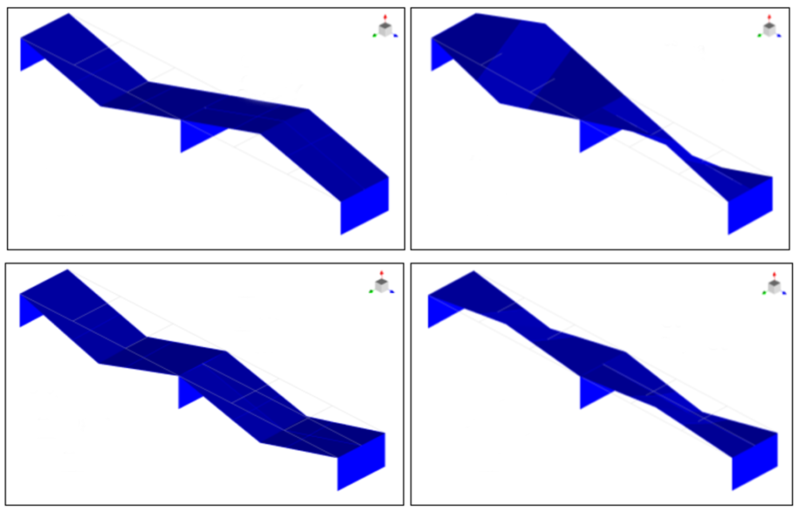 In such cases, a statistical analysis of the OMA data must be used to determine the modal properties of the bridge. After the initial survey, follow-up surveys every few years check the stability of the modal parameters and provide an early indication of the need for more in-depth analysis. Currently, an OMA survey is a manual operation that can take up to several days, depending on the complexity of the bridge and the number of transducers required. The equipment is high-end and expensive, and includes low-noise, high-dynamic-range data acquisition systems, and robust, extremely high-sensitivity seismic accelerometers that employ integrated electronics piezo-electric (IEPE) or force-balance technology. Figure 1: Daily acquisition with constant presence of the operator using IEPE seismic accelerometers. After the initial analysis, periodic surveys are required to check the bridge condition; these surveys follow the same procedure as the original OMA, representing a considerable recurring cost. Low-cost networked technology can provide a better solution. After the initial analysis, a permanently-installed automated system can continue to provide dynamic monitoring of key kinematic parameters without the need for an onsite operator; the data can be transferred to the cloud for in-depth modal analysis. MonoDAQ has worked with Italian engineering consultancy ESSEBI to develop the MonoDAQ-E-gMeter for this purpose: the module includes a triaxial MEMS accelerometer, signal conditioning circuitry, analog to digital converters (ADCs) and an industrial EtherCAT interface. In conjunction with the DEWESoft data-acquisition software framework, the system makes large-scale continuous monitoring a reality. Based on the experience of ESSEBI, the accelerometer meets high demands in terms of spectral noise density (upper limit of 25 µg/vHz). Figure 2: MonoDAQ-E-gMeter triaxial MEMS accelerometer module complete with A/D converter and connectable directly to a PC. The MonoDAQ-E-gMeter can measure accelerations between +/- 2g and +/- 8g. and has a typical -3dB bandwidth of 1000Hz. Multiple MonoDAQ-E-gMeter modules can be daisy-chained with shielded (SFTP) cables at node-to-node distances of up to 50 meters. The EtherCAT network connects to a PC that acquires the data; the PC can then perform the data analysis or transmit the information to a cloud infrastructure. To begin the process, an initial reference OMA was first performed on the bridge using the technique described above. In this OMA, sixteen sensors were placed at measurement points on the driveway platform, along the side quay, and near the lane demarcation lines. The measurement signal chain consisted of high-sensitivity and high-performance IEPE accelerometers with low-noise data acquisition systems, 24-bit A/D conversion, and a dynamic range of more than 150 dB. The permanent monitoring system, as can be seen from Figure 4, provides six measurement points located only at the mid-section of both bays. Specifically, the first span is equipped with one triaxial accelerometer for each of the three main deck beams while the other span is instrumented with one triaxial accelerometer on each of the two side beams only. In the permanent monitoring system, the sensors are instead installed directly on the lower platforms of the main deck beams and on the top of the central stack. Once the permanent system was in place, an OMA was performed by acquiring data from all the channels for one hour. 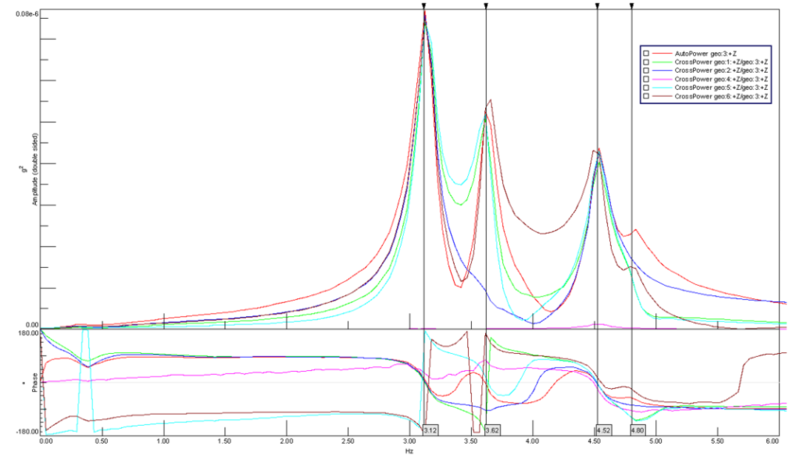 Figures 5 and 6 compare the cross-power spectra in the z (vertical) direction between the reference OMA and those obtained from one hour of data collection by the permanent monitoring system. The permanent monitoring system is simpler and much lower-cost, so its performance is lower. Nonetheless, the two figures exhibit excellent correlation in both amplitude and frequency, and show the value of being able to carry out an “on demand” OMA whenever necessary without an on-site visit. They also confirm that the data obtained by the permanent monitoring system is reliable. Figure 5: Cross power spectra in the Z direction from the initial OMA with seismic IEPE accelerometers. 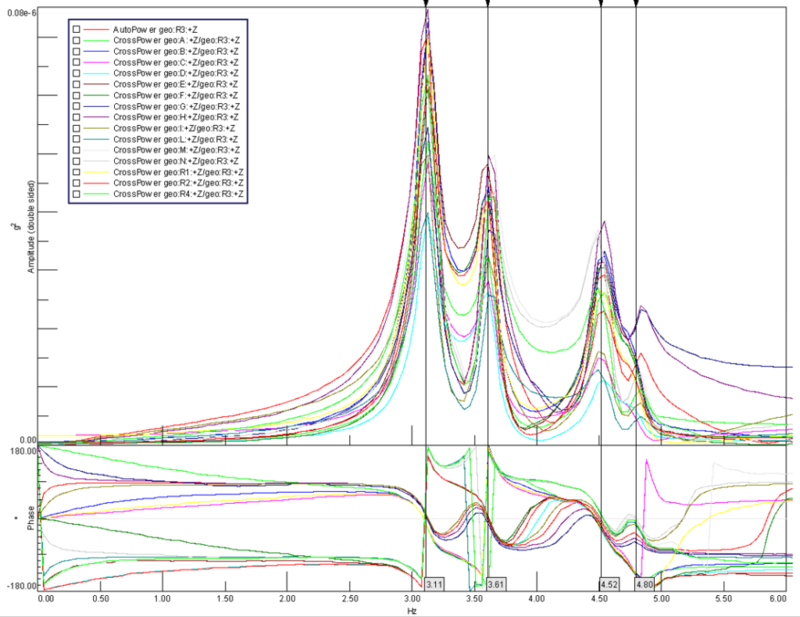 Figure 6: Cross power spectra in Z direction from OMA based on data from permanent monitoring system (MonoDAQ-E-gMeter). The correlation can be improved further by collecting the on-demand OMA data over a longer time period, progressively improving the signal-to-noise ratio. It is clear that the permanent monitoring system is very useful for extracting batches of data, with longer or shorter intervals, in order to perform an OMA whenever the need arises. Figure 7: First four modal forms taken from OMA “On demand” by continuous monitoring. Aside from the benefits that can be obtained from the continuous tracking of a predetermined frequency (for example the first bending on the vertical plane), deeper analysis of the data can yield kinematic quantities that are valuable as indications of damage potential. The particle velocity (speed) induced by vehicular traffic is one such quantity: due to the large variability in the magnitude of the induced excitation, many standards such as ISO 4866, DIN 4150, UNI 9916 and SN640312a define maximum allowable speed values that apply in specified conditions. Although these regulations generally refer to buildings and to the measurement of the vibrations induced in horizontal planes, the response of a bridge deck exhibits similar behaviour. DIN 4150 specifically states that the standard is applicable to all structures designed to withstand static loads that do not have to comply with particular dynamic load requirements. Bridges, at least as far as the local (Italian) building regulations are concerned, are included in this category. A bridge is continuously vibrating due to the variable and random action of passing vehicles, and the magnitude of the speed induced by these vibrations is an extremely sensitive indicator of the bridge response. ESSEBI has used this principle to develop an algorithm that generates universal and generalized speed thresholds regardless of the cause of the vibration. The DEWESoft software environment allows a straightforward implementation of these algorithms and outputs real-time results during the measurement process. Widespread adoption of OMA monitoring using these techniques will minimize the risk of more bridge disasters, and low-cost hardware makes permanent automated installations a real possibility in the near future. Contact MonoDAQ for more information about the procedures, algorithms, and components used. Detailed specs and system integration info of MonoDAQ-E-gMeter are available here. It can also be ordered at US distributors such as Mouser. Learn more: specs and pricing of the MonoDAQ-E-gMeter system for continuous monitoring. Learn more: DEWESoft software and SIRIUS system for qualification and periodic modal analysis. 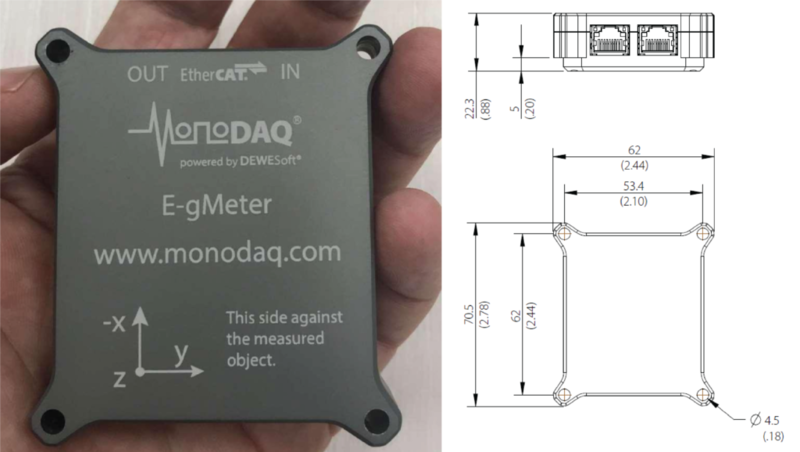 MonoDAQ would like to thank ESSEBI for expert advice and application support in the development of the MonoDAQ-E-gMeter device.